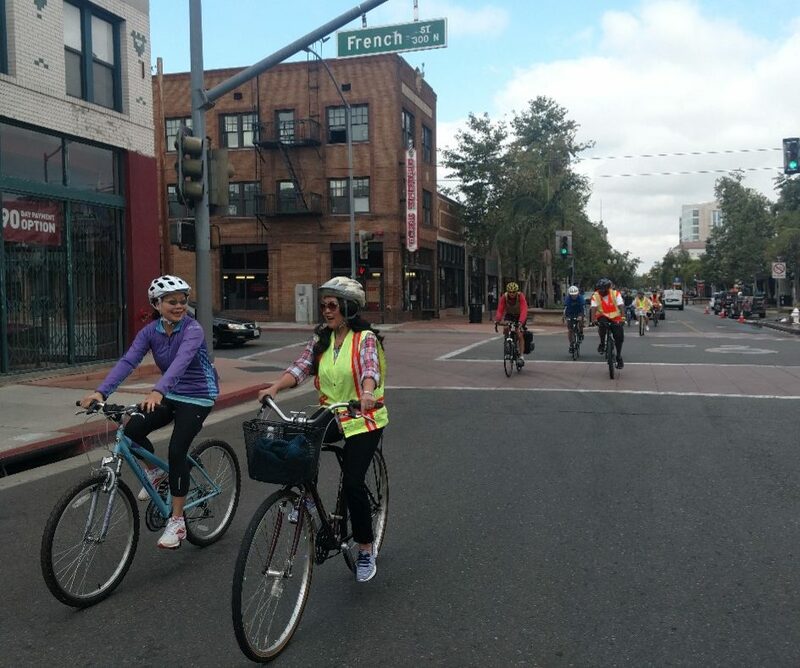 Flanked by helmeted cyclists, some in racing jerseys and others in plain clothes like hoodies and flannel, Zdenek Kekula pointed toward Ross Street where a green-striped bike lane was installed last year in downtown Santa Ana. The group standing in Birch Park listened to Santa Ana’s senior civil engineer explain how, when he started his job eight years ago, the city would never have agreed to any bike lanes. “I’m happy in the past few years that has changed,” Kekula said. Now, he said, Santa Ana is more likely to ask him how to put in a bike lane than to automatically reject the idea. 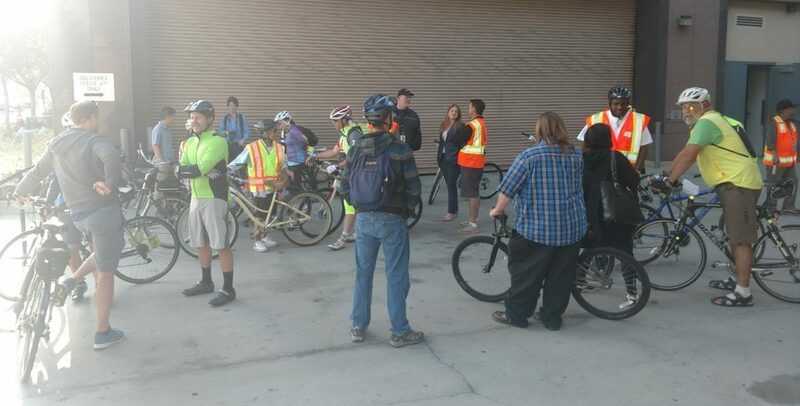 This was the first and only stop on Tuesday’s Bike-To-Work Day morning ride hosted by Caltrans in downtown Santa Ana. The more than twenty cyclists that joined the ride got a quick tour through downtown to see some of the current projects there, like green-striped bike lanes and the city’s first bicycle boulevard on Third Street. “I wanted people to see the infrastructure of Santa Ana, because there are a lot of Active Transportation Program projects that have been approved [for funding], and [more] are in the works in the planning, design, and construction phases,” said Marlon Regisford, an associate transportation planner and Caltrans District 12’s bicycle and pedestrian coordinator. The ride was open to all comers, but more than half of the cyclists were Caltrans staff. Others included staffmembers from the Orange County Transportation Authority, a representative from a Denver-based consulting firm, and Orange County Bicycle Coalition members, who were marshalling the route. The Bike to Work Day group met up behind the Caltrans offices in Santa Ana. When bicyclists gathered at the building’s front entrance, they were told that a large group couldn’t meet there and were redirected to the loading dock. Caltrans has been hosting rides during Bike Month since 2009, but this was the first ride out of the new office they moved to from Irvine. Ryan Chamberlain, Caltrans District 12 director, said that these rides are important because they give his staff an opportunity to experience the streets they work on from the perspective of bicycle riders. 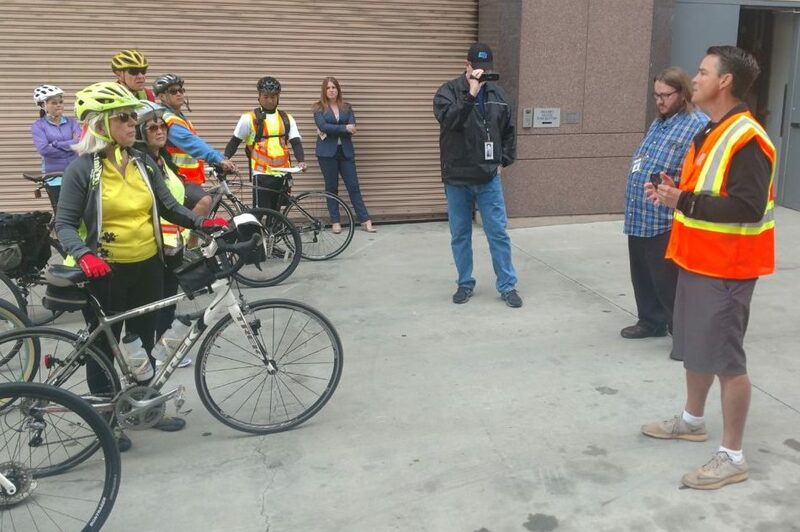 Kim Robinson, a 54-year-old Caltrans project engineer, said it was her first time joining a Caltrans ride. Riding in the group, she said, made her more comfortable riding on the street. Since the Caltrans office moved to Santa Ana, it has got her thinking about her commute. “Having the office move gives me more of a chance to ride, since now it’s closer to home,” Robinson said. Yet the ride wasn’t without its issues. Even before they headed out, cyclists complained about having to move the meet-up to the loading dock in the back of the building. Caltrans leases its offices, and the property owner’s policy doesn’t allow that many bicyclists to gather in front of the building. Chamberlain said that the offices are newly leased and that he and his staff are still working on clarifying what’s allowed. But, he added, his staff would look into avoiding a similar situation in the future. Riding down Fourth Street in downtown Santa Ana. 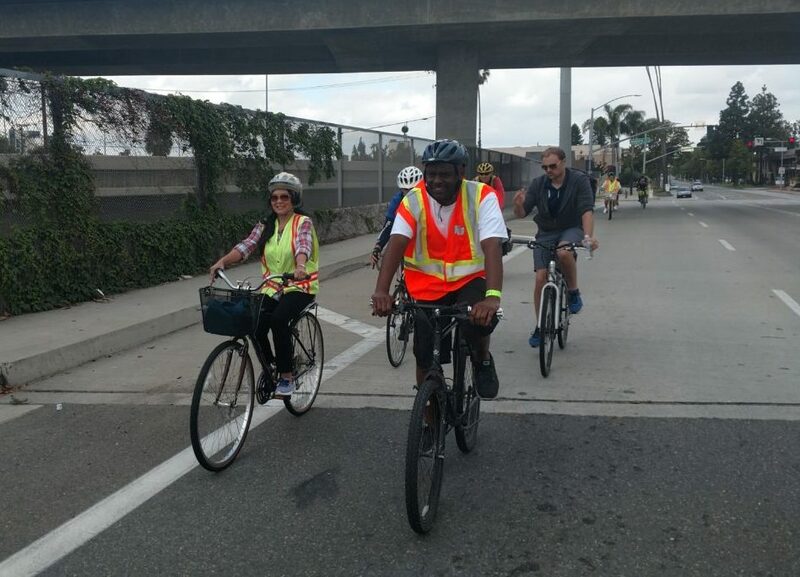 Marlon Regisford, associate transportation planner and District 12’s bicycle and pedestrian coordinator (front right), crosses Fourth Street heading east toward Caltrans offices. Green-striped bike lanes on Civic Center Drive, headed East. Green-striped bike lane on Ross Street, headed North toward Civic Center Drive. Ryan Chamberlin, Caltrans District 12 director, in safety vest, welcomes bicyclists prior to the start of the ride. Zdenek Kekula, Santa Ana senior civil engineer, talks to the group about bicycle and pedestrian infrastructure in the downtown.